A 4 course dinner for two people including a bottle of wine at Downstairs Restaurant, Clontarf, Dublin 3. With this exclusive offer from Rewarding Times and Downstairs Restaurant, we are offering a four course dinner for two people plus a bottle of wine for only €69. Downstairs was opened in Clontarf in 2010 on the site of the old Hollybrook Hotel (5 minutes walk from Clontarf Dart Station). The restaurant is casual and has a great buzz, and front of house is efficient and friendly ensuring a memorable and relaxing experience. Chef-proprietor Brian Walsh’s demand for quality produce is the cornerstone of the Downstairs approach. 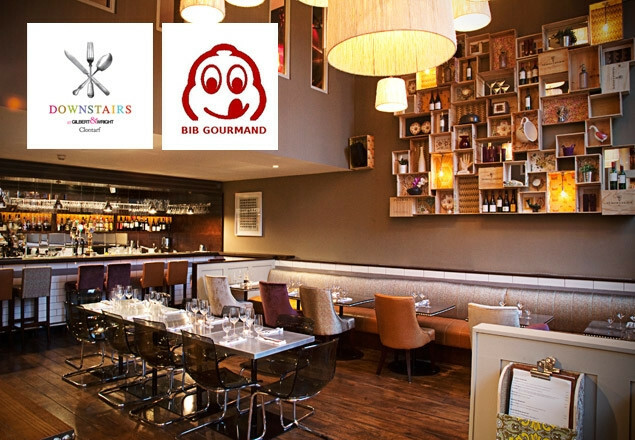 In 2012 Brian and his Downstairs team were proud to be awarded a Bib Gourmand by the esteemed Michelin Guide. Michelin describe Brian’s cuisine as 'refined, honest, balanced cooking which shows respect for natural flavours'. Downstairs is open 7 nights a week from 5.30pm and Sunday lunch is available from 1pm. The design of the restaurant comfortably allows for intimate dining as well as large parties. Voucher valid 7 days a week Monday to Sunday from 5.30pm. Vouchers are valid from 2nd September until 2nd December 2013 inclusive. No exchanges of wine for other beverages allowed. Wine is either a bottle of red or white, no half and half. 4 course dinner includes starters, main courses, desserts, tea/coffee for 2 people plus one bottle of either red or white house wine.